In this series so far, we’ve discussed a lot about the physics of the ACME EDM experiment: the atomic physics methods we use to look for a small asymmetry in the electron’s charge distribution. However, we’ve never tackled the big question directly: why does the electron’s charge distribution matter at all? The precision achieved on the experiment may be mind-boggling, but precise measurements are not necessarily useful in and of themselves. For example, if I picked up a random pebble on a beach, there’s not much point in being able to measure its length to the nearest nanometer. In physics, precise measurements need theoretical context to be interesting. If the thing you’re measuring is also predicted by a certain theory to have a certain value, then measuring it carefully will serve as a strong test for that theory. This shows the importance of both theoretical and experimental physics. Experiment without theory is just stamp collecting, while theory without experiment is just philosophy. How does this apply to the electron electric dipole moment (EDM)? What is the theoretical context that makes it interesting? The short answer is, the existence of an electron EDM would result in a symmetry violation which is not accounted for in our standard fundamental theories of physics. Symmetry is everywhere. The most common symmetry we encounter in everyday life is spatial symmetry. Basically, if you can fold something (either in reality or in your imagination) along some imaginary line and have the two sides match up against each other, the object possess spatial symmetry of some kind. 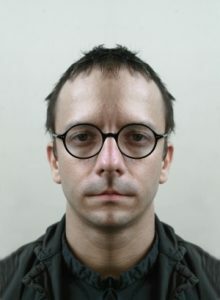 Symmetry of a human face. Symmetry is so ubiquitous that you can say it’s a basic component of why nature is intelligible to us. The presence of a spatial symmetry immediately creates a pattern, and understanding nature (science) is all about pattern recognition. Some things are more symmetrical than others. In the example above, you can divide a triangle along three different lines (or axes of symmetry) and have two matching sides in each case. 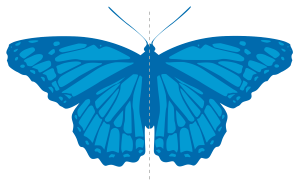 However, a human face and butterfly body only have one axis of symmetry. A circle, on the other hand, has an infinite number of axes you can divide it along. In physics, the concept of symmetry includes the spatial symmetry we discussed above: this particular symmetry is called parity symmetry (P-symmetry). It encompasses more than just geometrical shapes. Essentially, it means that the laws of physics will look the same if reflected in a mirror. So imagine that when you’re looking at a mirror, you’re actually looking into an entirely different parallel universe where you are left-handed instead of right-handed (or vice versa). If physics respects P-symmetry, this world will experience the same laws of physics as we do: gravity would have the same acceleration on Earth (9.81 m/s2 , for those of you who still remember), the electromagnetic force would have the same strength, and so on. For a long time people thought that parity symmetry must have been conserved. This seemed reasonable: why should physics change if everything right-handed were to become left-handed? Indeed parity symmetry is conserved in the case of gravity, electromagnetic, and strong forces – 3 out of the 4 forces of nature we know. However, in a famous experiment in 1956, American physicist Chien-Shiung Wu and colleagues found that this is not the case in the weak force, the force that mediates radioactive decay. Diagram of the Wu experiment depicting preferential beta decay to the left. Figure taken from Wikimedia Commons. 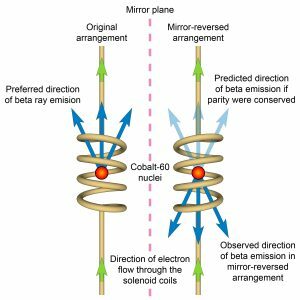 The experiment tracked the direction of Cobalt-60 nuclei decay. There were two runs, one of which was the mirror-reversed version of the other. If parity symmetry were conserved, then if the nuclei decayed preferentially to the left in one instance, the mirror image would decay to the right. However, it was found that the decay was always to the left! This effect was explained by the theorists C.N. Yang and T.D. Lee, which won them a Nobel Prize in Physics in 1957. Illustration of how an electric field switches direction under a parity transformation, which in the case of the ACME experiment switches the direction of the ThO molecules as well. Thus, if it exists, just like an electric field, an electron EDM is not conserved under a parity transformation. so under a parity transformation spin does not change. Now, for various more complicated reasons 3, if an electron EDM did exist, it would be aligned or anti-aligned along the direction of the electron’s spin. For the sake of simplicity, let’s assumed that its value is just 1 ( ) and so it is aligned along the direction of the spin. Under a parity transformation, the spin would stay put, but the electron EDM, having to align with the electric field (as we discussed above), has to flip sign. Thus after the parity transformation, we would have , which would make it anti-aligned with the spin. Therefore, an electron EDM would violate parity symmetry. 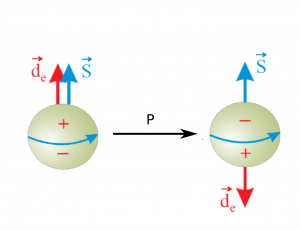 Illustration of how an electron with a non-zero EDM would change under a parity transformation P.
Besides P-symmetry, physics also respects two others: charge (C) and time (T) symmetry. In a C transformation, a positive charge (usually an electric charge) is changed to a negative charge. Electromagnetism respects C symmetry, just as it does P symmetry: for example, two negative charges will repel each other in the same way that two positive charges will. C symmetry is the reason why we think of electricity as flowing from positive to negative voltage, while in reality it’s the electrons (which have negative charge) that flow, instead of their positively-charged antimatter cousins, positrons. Lastly, a T transformation runs time backwards. Things which spin clockwise spin now spin counterclockwise, and vice versa. Did any of the physics change? If you were to watch a video of swinging, friction-less pendulum, you would not be able to tell whether the video was run backwards or not. Thus gravity respects T symmetry. The same goes for electromagnetism. Notice that electromagnetism (EM) respects all three symmetries: C, P, and T. However, while EM as a whole respects T-symmetry, a magnetic field by itself does reverse under a T-transformation. 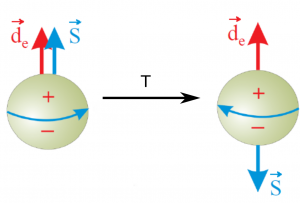 Similarly, spin, which is really a form of angular momentum (similar to how a spinning top has angular momentum), also reverses direction under T. However, an electric field does not reverse under T.
Thus in our situation with the electron, under a T-transformation, the direction of the electron spin flips but the electron electric dipole moment would stay put. The system as a whole changes. Thus, the existence of an electron EDM would violate T-symmetry. After the discovery that C symmetry was not fully respected in physics by Wu’s experiment, physicists wondered whether combinations of these transformations would still result in the same physics. In a CP transformation, both charge and parity transformations are applied to the system successively: all charges are flipped from positive to negative and vice versa, and all spatial directions are flipped. The short story is that CP-symmetry is also violated. This was discovered in a famous experiment by Cronin and Fitch in 1964, where they observed CP violation in kaon decay. (A kaon is an exotic type of fundamental particle which unlike protons, neutrons and electrons usually only exist by being artificially produced in particle accelerators.) This showed that CP-symmetry was not respected in the weak force, and won the pair the Nobel Prize in Physics in 1980. One symmetry has never shown to be violated, however: CPT-symmetry. In a CPT transformation everything is flipped: charge, spatial positions, and time. If CPT symmetry were to be violated, the consequences would be way more disastrous: it would imply a violation of Lorentz invariance, or Special Relativity. Experiments testing CPT are undergoing right now, most of which look for differences between matter and antimatter (we haven’t found any). This includes some experiments in my lab: ATRAP, which is looking to do spectroscopy on antihydrogen (to compare it with hydrogen), and an experiment looking to measure the difference in the magnetic moments of the electron and positron. CPT symmetry is so foundational to modern physics that it is assumed in almost all contexts. Transformation of an electron with an EDM under parity and time. At the end we get the same electron as we started with, only that it’s upside down. Now, if CPT symmetry were always true and PT is preserved by the electron EDM, then it must be the case that C symmetry is preserved, so that the product is also preserved. However, this also implies that CP would be violated: implies that . Thus the existence of an electron EDM, assuming CPT symmetry, would imply a CP violation. Why would CP violation be a big deal? After all, CP violation was already found by Cronin and Fitch in the 1960s, as we discussed above. However, it is also the case that theorists expect there to be more CP violation in nature than what they found, and puzzlingly, almost no other sources of CP violation has been found since then. The shortage of CP violation in the known universe makes it difficult to explain baryogenesis, or how the current abundance of matter over antimatter came about after the Big Bang. We will talk about the amazing details of this in the next post, which will fully answer the question for why the existence of an electron EDM would have amazing implications in explaining how everything came to be.